Note: You can watch a video interview with co-author John Kessler. "A significant amount of the oil and gas that was released was retained within the ocean water more than one-half mile below the sea surface. It appears that the hydrocarbon-eating bacteria did a good job of removing the majority of the material that was retained in these layers," said co-author John Kessler of the University of Rochester. Kessler noted: "Interestingly, the oil and gas consumption rate was correlated with the addition of dispersants at the wellhead. While there is still much to learn about the appropriateness of using dispersants in a natural ecosystem, our results suggest it made the released hydrocarbons more available to the native Gulf of Mexico microorganisms." Their measurements show that the consumption of the oil and gas by bacteria in the deep Gulf had stopped by September 2010, five months after the Deepwater Horizon explosion. "It is unclear if this indicates that this great feast was over by this time or if the microorganisms were simply taking a break before they start on dessert and coffee" said Kessler. "Our results suggest that some (about 40%) of the released hydrocarbons that once populated these layers still remained in the Gulf post September 2010, so food was available for the feast to continue at some later time. But the location of those substances and whether they were biochemically transformed is unknown." Previous studies of the Deepwater Horizon spill had shown that the oil and gas were trapped in underwater layers, or "plumes", and that the bacteria had begun consuming the oil and gas. By using a more extensive data set, the researchers were able to measure just how many tons of hydrocarbons released from the spill had been removed in the deep Gulf waters. 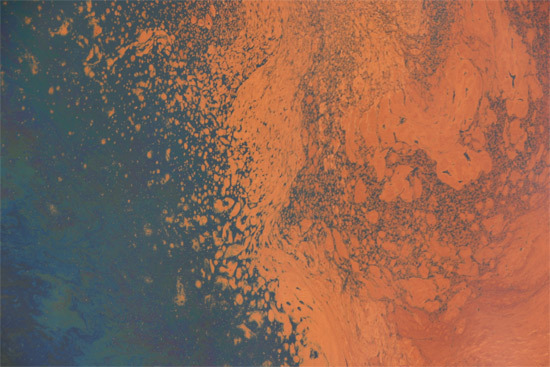 The team's research suggests that the majority of what once composed these large underwater plumes of oil and gas was eaten by the bacteria. The researchers calculated how many tons of oil and gas had been consumed and at what rate by first measuring how much oxygen had been removed from the ocean. Mengran Du explained that "when bacteria consume oil and gas, they use up oxygen and release carbon dioxide, just as humans do when we breathe. When bacteria die and decompose, that uses up still more oxygen. Both these processes remove oxygen from the water." Du added that it is this lower oxygen level that the researchers could measure and use as an indicator of how much oil and gas had been removed by microorganisms and at what rate.